It all started with new Hiking Boots | Life. Crazy. Beautiful. About three weeks ago, there was a sale on at an outdoor store in the city. 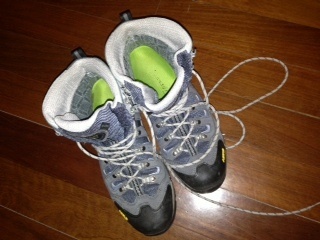 I thought I would go and check it out, on the off chance that I could get some new hiking boots at a good price. My hopes weren’t high because, as we all know, the good stuff is never usually on sale – and certainly not in your size. But – miracles do happen. I found some – truly awesome – hiking boots, in my size – at 50% off! I was so excited I was like a kid with new soccer boots. I wanted to wear them all the time. I stopped short of wearing them to bed. And since then, I’ve been walking. Walking home from work. Walking with my pack. Walking. Walking. Walking. And enjoying every minute of it. Not only have I been walking, I’m back up to full pack weight – 20 kgs. So I’m truly adventure ready. This entry was posted in Uncategorized and tagged adventure, hiking, hiking boots by Nimmity. Bookmark the permalink.